LNG: In North America, 38 liquefaction terminals are expected to become operational between 2018 and 2022. Total liquefaction capacity in North America will increase to 2022 at a 60.6-percent average annual growth rate. Capital expenditure on new liquefaction projects in North America through 2022 will be $285.5 billion. 58 percent of investments on new North American LNG liquefaction projects will be spent by the US through 2022. The United States will significantly contribute to capacity growth in North America’s liquefied natural gas (LNG) industry between 2018 and 2022. 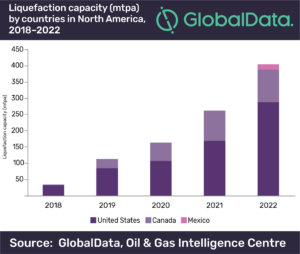 The US is set to have the highest liquefaction capacity additions among all countries in North America, while the regasification capacity is expected to remain the same in the region, according to leading data and analytics company GlobalData. The company’s report, “LNG Industry Outlook in North America to 2022,” forecasts total liquefaction capacity in North America to increase from 19.5 million tons per year (mtpa) in 2017 to 405.1 mtpa in 2022 at an average annual growth rate (AAGR) of 60.6 percent. North America is expected to have an estimated capital expenditure (capex) of $285.5 billion on new build liquefaction projects, of which, around 58 percent will be spent by the US and the remaining will be spent by Canada and Mexico, during the outlook period. The US and Canada are the major countries in North America for LNG liquefaction terminals. In North America, 38 liquefaction terminals are expected to become operational between 2018 and 2022. The total planned liquefaction capacity in North America in 2022 is expected to be 376.3 mtpa. The US will lead North America in terms of liquefaction capacity additions with 258.8 mtpa, increasing from 19.5 mtpa in 2017 to 287.3 mtpa by 2022. The country is expected to spend around $167.28 billion on new build liquefaction terminals during the outlook period. GlobalData identifies Canada as the second highest country in North America with planned liquefaction capacity additions of around 101.1 mtpa by 2022. The country is expected to spend roughly $105.3 billion on the development of new liquefaction terminals. Mexico is the lowest contributor to the liquefaction capacity growth in North America. The country is expected to add around 16.4 mtpa of liquefaction capacity by 2022 and is projected to spend around $12.9 billion on the development of new liquefaction terminals during the forecast period. In terms of capacity, Orca Floating terminal in Canada, Cameron II and Corpus Christi terminals in the US are the top planned and announced LNG liquefaction terminals in North America by 2022. In terms of capex, Orca Floating and Grassy Point terminals in Canada and Corpus Christi terminal in the US are the top planned and announced LNG liquefaction terminals in North America between 2018 and 2022.